WHEN THE ALIENS COME, WHO’D YOU THINK THEY’RE GOING TO RELATE TO? Today is International Baldness Day. There aren’t any Bald Pride Marches organised that I’m aware of. Nor are their any inspirational bald quotes to boost the morale of those of us who suffer this affliction. (To be honest, right now I’m more interested in finding out whether any of you can name the woman visible just to George Costanza’s left in the photograph above?) All the same, and in honour of the day that’s in it, I’ve given a fresh makeover to one of the more popular articles I’ve ever written. If its Georges left its Ruthie Coen.If its my left looking at George thats a tough one! Absolutely right Kev, I’m impressed! It’s a tough one either way yeah but Ruthie Cohen. I knew that! 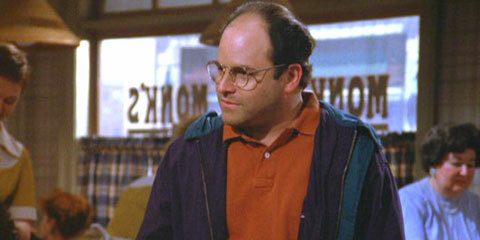 Well I did download all 40GB of Seinfeld.And Im a big fan of George. So how come you never followed through on the whole combover thing? Hey Eoin-Good article.do you think Austin O’Malley (Mayo footballer) might have said that second bald quote and also how do you fancy Mayo against either Limerick/Meath? Sean McT. Good article. If you were ever to go with a hat, I’d see you with a permanent baseball cap, probably while wearing a tweed suit. @Jenny: Butler did try something with his hair but we were never sure if it was a combover, toupee or a combination. @ Sean – Possibly not. But “Better a bald head than no head at all” has to be the least inspiring bald rallying cry I’ve ever heard. Limerick look decent and I know they beat Meath last year but, like every other Mayo person, I imagine, I’d absolutely love another crack against Meath. Pretty confident we’d beat either side in any case. @ Colin – (a) That link doesn’t work and (b) what the hell picture are you trying to post?? Weird, link was working earlier, bloody internet. Hope that stays up longer. @Colin- In fairness I think that was a brief spell of madness when the paintings weren’t selling too well down in Galway. My sister Clare took that picture of me trying on stupid clothes in a Good Will thrift shop in Maine. She posted it to Facebook, from whence Colin ripped it. The episode of Seinfeld when George rejected the beautiful woman ‘cos he found out she was bald was a classic. If you found yourself in the same situation what would ya do Eoin? (a) Would you date a bald woman? (b) Why should I be any different? (a) on reflection, I think I would if she had a nice shape of skull, like. One of my favourite ever lines from Curb Your Enthusiasm is when a man overhears Larry whistling Wagner and accuses him of being a self-hating Jew. It’s the same in this instance. I am neurotic, but it has nothing to do with being bald!